One of the most popular holiday resorts at Lake Baikal among Russians is Novy Enkhaluk which meanwhile consists almost completely of holiday parks offering a variety of simple or luxurious accommodation. One reason for the place's popularity are the gorgeous sandy beaches as well as the relatively warm water of Lake Baikal in the bay. The holiday park consists of several two-storeyed buildings with single to 3-bed rooms, several wooden cabins for 3  11 people, and leisure facilities. During the summer season it can accommodate up to 75 guests. In summer you will reach Novy Enkhaluk by ferry across the Selenga, in Winter across the ice. Full board included for all prices. Extra beds can be ordered for 1000 roubles per day. The guest house opened in 2007 and offers double rooms and family rooms for 4 people. The holiday camp (guesthouse and cottage) offers duble and family rooms for up to 20 guests. 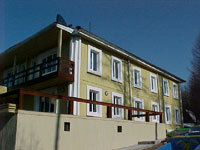 Single cottages for 2, 3, 4, 5 or 9 persons. The toilets are outside. There is some extra territory for campers. 70 % of the guest are permanent visitors.